We have 15 RV campsite pads. There are both back-in & pull-thru sites available. 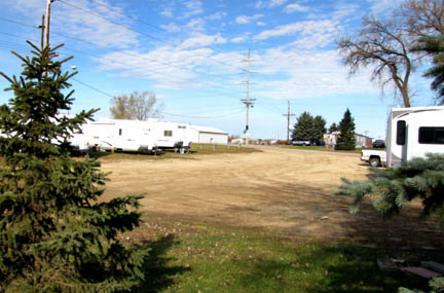 Prairie Pasque Campground offers full hook-ups including: electricity, sewer, city water, garbage service. Nice level lots. 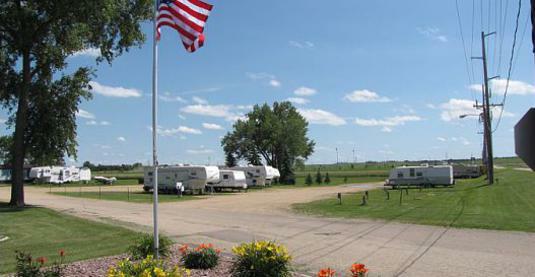 Easy access to all amenities as we are the most convenient campground in Watertown, SD. We do not have any shower facilities. Wi-Fi is availible if you are able to access it. We do not guarantee access to Wi-Fi. As you can see in the above picture, we do not have much for shade trees and we are not next to a nice lake; but we are very convenient and we do our best to make your stay a pleasant one! :) You may call anytime with questions. WE ARE OPEN! We usually close about the middle of November. Being in South Dakota, we have learned to be flexible as the weather can be unpredictable. 1.75 miles West of I-29 (Exit 177) on U.S. Hwy. 212. Turn South on 17th St. South, which is right before Watertown Chrylser store. You will go 1/2 mile South and then turn East onto 16th Avenue SE. Our mailing address says 14th Ave., but the campground is actually on 16th Ave. Check for availability below. Call with any questions you may have. We will do our best to accommodate your requested time.